Snoring is one of the common ailments of man. It is said that 90% of men snore while there are a couple of women who do too. But for one to know how to remedy the snoring concern, one must know full well its causes. 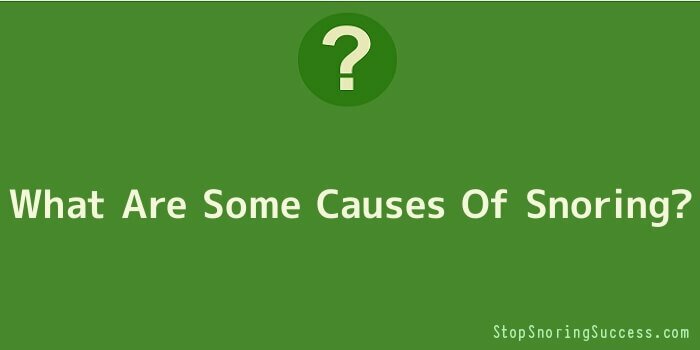 The following could be a few of the most common causes of snoring. Snoring occurs when your throat is in a relaxed mode. This happens when one is asleep. When the throat muscles are at rest, the vibrating sounds can be heard much better since the air passageway gets narrower. The narrower the air passage is, the louder the vibration is. Men are said to snore more especially those who are in their fifties. This is because of the structure of the male’s neck which is much thicker and wider when compared to that of the females. The females are less likely to experience the snoring too since they have an abundance of progesterone. Progesterone is the hormone that is frequently found in many anti snoring devices. Men on the other hand have the hormone called testosterone which helps a lot in the relaxation of air passageway which makes them more prone to snoring. Women who are suffering from polycystic ovary syndrome are more prone to snoring and sleep apnoea, studies revealed. Another cause of snoring is allergy which makes the throat thicker and the air passages to narrow. When one takes an anti allergy medication, the tissues in the air passage also dry up easily. The same goes when you are hit with the flu bug with cough as its right hand man. There are also cases when the throat tissues are slightly thicker and once the person goes through surgery this may trigger the snoring frenzy. When a person drinks a lot of alcohol or is used to drinking a lot of alcohol he is more prone to snoring too. A person with a huge belly is also more prone to snoring. Same as someone who is fond of using nasal spray excessively as this might irritate the air passage which makes snoring all the more possible. Once your tonsils and your adenoids are not in their normal size, you tend to become more susceptible to snoring. Smoking also leads to snoring, as it may cause the inflammation of the air passage. A huge tongue is also a cause for snoring. This is because the air that goes through the respiratory tract is blocked. This is the same thing to happen when one has large tongue or when you are developing goitre or having enlarged thyroid glands. Another popular cause of snoring is being overweight. There are also some medications such as antibiotics that can relax your throat muscles and therefore cause snoring. Now that you know the common causes of snoring, it is much easier for you to get rid of it. The best way to do so would be to maintain a healthy lifestyle and to exercise a lot and keep a healthy weight.